Location: 183 Mule Academy Rd. It all started in Fishersville, Virginia in 1981. Our founder built a circle mill and started bringing logs in from the forests to saw. 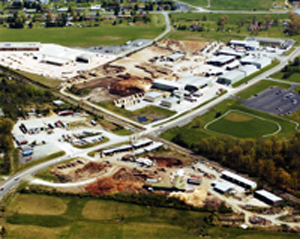 From humble beginnings, we have grown to a multi-site company throughout the state of Virginia employing over 150 people. Fishersville, our home office, is our most diverse location. 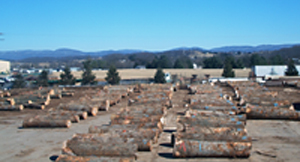 We have two log yards and two sawmills here. The original mill is a circle sawmill, and the second is a band saw mill with a resaw. Our forestry department is headquartered here and lead by degreed foresters. We have SII dry kilns with kiln capacity of 450,000 board feet, for a total of 1,950,000 board feet of kiln drying capacity. Our fleet of trucks, curtain sides, open trailers and heavy equipment is maintained by our garage. Fishersville is located at the crossroads of interstates 81 and 64 giving us convenient access to our domestic clients and an easy run to the ports for shipping overseas. This location also has a strong retail following supplying the locals with everything from sawdust and mulch to custom sawn green and kiln dried lumber. As a company we have established and maintained long standing relationship with both our domestic and international clients. We believe in protecting the renewable resource we deal in, and we practice sound forest stewardship.